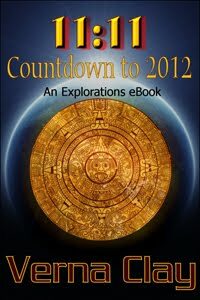 11:11 Countdown to 2012: An Explorations eBook is a 101 primer on the spiritual and meta-physical enlightenment's leading up to the events of 2012. Eve Applegate is seeing the numbers 11:11 wherever she goes and she begins to feel like she is losing her sanity. After meeting her new neighbour, Theodore Baldwin, who is an aspiring author, new light is shed upon Eve's confusion. Befriending Eve, Theo asks her if she would edit his book for him. Though Eve has tried to put her distance betwixt the two, she finds him to be sexually appealing and she feels an electrical surge whenever he is in her presence that she is unable to explain, however, she finally agrees to edit the book and her life is forever changed. Eve is flabbergasted, for Theo is writing about the numbers she is seeing and explains the phenomena that is surrounding many inhabitants of the Earth. Big things are approaching and Eve is terrified as she is thrust into danger and whisked around the world on a quest, one in which mankind's destiny rests upon her shoulders. Verna Clay shares a little bit about all the spiritual and meta-physical events that are unfolding on Earth. She touches upon each of them in a way that encourages the reader to do more research into each of the topics. Such topics as, crop circles, mayan prophecy, Atlantis, the Henges, and numerology to name just a few are briefly and in generalized terms explained to the reader. If you like meta-physical reads with a bit of a love story thrown in, then you will enjoy this book. I thought it was good but could have been better. The story jumped around to quickly to absorb the knowledge being shared and a more slower paced account would have given the reader more to absorb than just having facts thrown at them dispersed between the love affair that appears to be growing between Theo and Eve. If you know anything on the topics mentioned, you won't find much to challenge you in this story, however, if you are an amateur to new age thoughts then this would definitely be a boon for you. To fulfill his destiny, Theodore Baldwin must bring Eve Applegate into "Realization" before the Mayan Calendar countdown year of 2012. The fate of the world depends on his successful mission! However, Eve is not cooperating; she wants nothing to do with him. He needs to come up with a plan, and quick! Will she fall for his scheme, or is the earth doomed to the same fate as Atlantis?